River Road house is a small timber frame dwelling in Oregon designed by Nir Pearlson, Architect Inc., a small firm with an interest in green design. 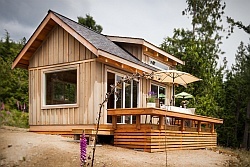 They were asked to create a comfortable and energy-efficient home built from sustainable materials. The clients, a couple nearing retirement, also wanted a home that would work for them as they aged, hence the decision to build a single-story house. With an efficient layout that maximizes views between spaces, the small house feels deceptively large. In reality it is only 800 ft2 (74.3 m2), and that includes two good-sized bedrooms. Vaulted ceilings contribute to the perception of space and openness. One of the stand-out features of this small house is its hybrid timber frame by builder Six Degrees Construction. The Douglas Fir posts and beams are exposed on the inside, giving the home a feeling of solidity and adding architectural interest. Wood is also used on the floor, ceiling, trim and cabinets. All the wood combined with the earthen plaster wall finish makes for a warm and welcoming home. The front door opens to an entry hall whose slate tile floor extends to provide a fire-proof base for the woodstove. The centrally located woodstove not only ensures even heating but also serves as a divider between the hall and the main living space, separating them without cutting off sightlines. Kitchen, eating and sitting areas form one large room. A large window seat in the sitting area provides a cozy spot to read or nap. The skylights and many windows fill the space with light and connect the occupants to the surrounding gardens. 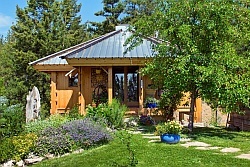 A door leads out to a covered sitting area on the expansive cedar deck that wraps around two sides of the small house. On the other side of the house, opposite the woodstove and entry hall, are the two bedrooms and bathroom. Like the living area, the master bedroom has a soaring ceiling, large windows and direct access to the deck. Clerestory windows at the peak of the roof allow southern light to wash over the hemlock ceiling. The second bedroom has double sliding doors that can open the room to the living area, allowing for flexibility of use. To keep the house comfortable while minimizing energy use, the timber frame was wrapped in double layers of insulation, eliminating the thermal bridging that occurs when the insulation is interrupted by structural lumber. 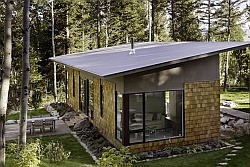 Photovoltaic panels and a solar water heater mounted on the south-facing roof provide much of the home’s energy needs. The River Road House plans are for sale through Houseplans.com. Photographs by/courtesy of Michael Dean Photography. all details spot on. beautiful home. I love everything about this house! I want to move in!! This is my home! I have been looking at small house plans for 3 years and finally have found my home. Love it and it will look perfect on my 5.5 acres. 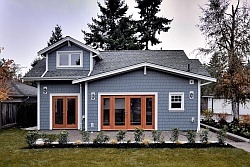 The reason for the tilted porches and overhangs is because of the rainwater collection system. The roof slants down, and because the overhand can catch a significant amount of water too, they went ahead and made it the reciprocal of the roof, so they could share one gutter system, to empty into the rainwater collection point. Very sustainable, and a great feature. 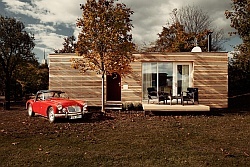 Pingback: Small House that Feels Big: 800-square-feet Dream Home? omg my dream house!! finally. 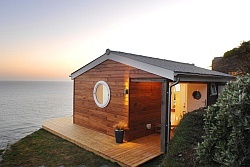 i have been searching tiny house plans forever it seems looking for 1st floor bedrooms. this is it!! but why are the overhangs tilted up? That was one of the things that caught my attention also and the the shower was tilted……… Do you build in Florida? This is a great house!! Can you share any data on project costs? What does something like this cost, beautiful home! This house is brilliant! Roughly, how much would it cost to build, please? This is such a wonderful home! I am so curious as to what the total budget was. Is there anyway to find out the construction costs as it was finished and displayed online? I have fallen in love with this houtskeletbouw (timber frame) home. Its so elegant and simply rocking! I can’t resist myself owning one such home. I am sure my to-be wife is going to love it. The interiors are just perfect and the finishing is awesome. A perfect place for a cosy living. Can I have one such dream house built in Belgium? Did you ever find out the price per square feet/meter finished? No one seems able to answer the all important question of costs. It is vital for keeping interest. Love this small house plan. Could you tell me how much it would cost to build it? All one floor is great but what about those stairs to enter the house? Do you have a picture of the second bedroom, or office off the entry-off the entry with the French doors? Any idea, at this point, if and/or where can I find the plans for this house? I’ve searched on houseplans.com but didn’t come up with anything like this. I love this house SO much! I decided to build and wanted to use the plan, but, my city felt it was too unique and said financing would be a problem, change it. With modifications, but still keeping the basic floor plan, mine was built for about $97000. (I did go to auctions, did lots of labor on it myself and had good people who were willing to lower their costs a little to get it done.) No solar yet, but will be ready when it is available in my area.The house as it is shown above with high end finishes, I’m sure would go $200,000 or more. I move in next weekend! As a retired, divorcee, still living with my ex-husband, due to his near death experience Christmas Day. I’ve attempted to find a builder in my area of southwest Missouri, to make adjustments so that I could afford it. The biggest problem from builder to realtor is the size. Perfect for me….but not for anyone else’s salable ideas. Our area was devistated by a tornado in 2011. There are still empty lots that need homes with people in them. I’ve thought what a good idea it would be to have a few of the houses, without all the bells and whistles, in my town. Please make the first one for me!!!! Can this design be modified to include wheelchair accessible doorways? It’s beautiful, I love it! Is there a washer and dryer hookup in plans?